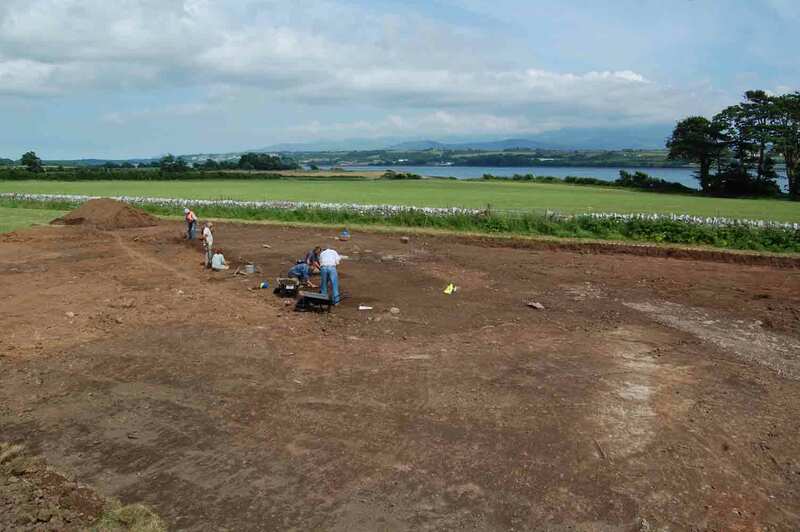 Dave Hopewell and George Smith from Gwynedd Archaeological Trust are carrying out an excavation at a site on Anglesey; on the opposite shore of the Menai Strait to Caernarfon. 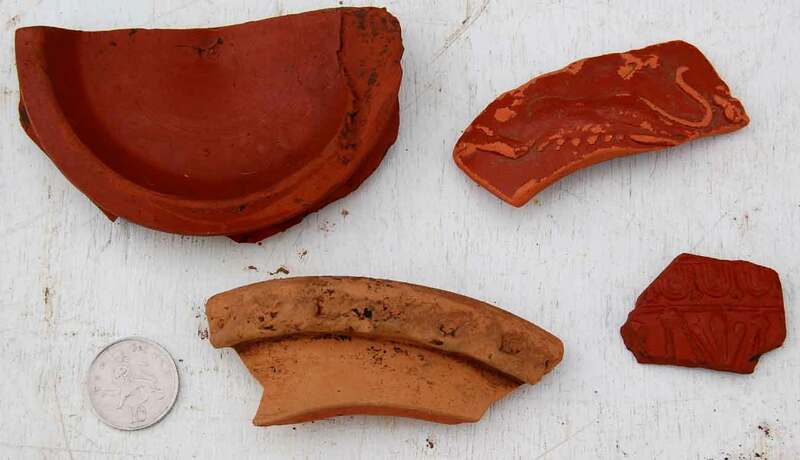 Recent finds from the area suggested a Roman site. 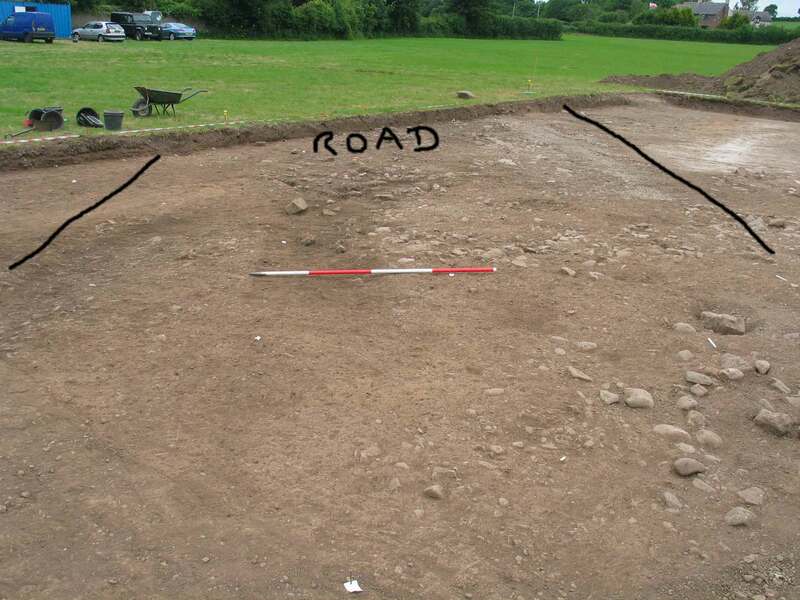 A geophysical survey revealed an extensive settlement alongside a road running inland from the Strait suggesting that it marks the crossing point from Segontium Roman fort. The excavation will be run as a community project with a team of local volunteers playing a major role in the project. The dig will run for three weeks starting on June 28th 2010. We got the site laid out; it looks bigger on the ground than on paper!! We are using a big mechanical excavator to clear the topsoil from an area of 40m x 25m. Dave the driver is very good and has worked on sites for us before. I volunteered myself for machine watching and directing duties. The ground is incredibly dry, dust down to a depth of the upper plough soil and then like grey concrete beneath that. 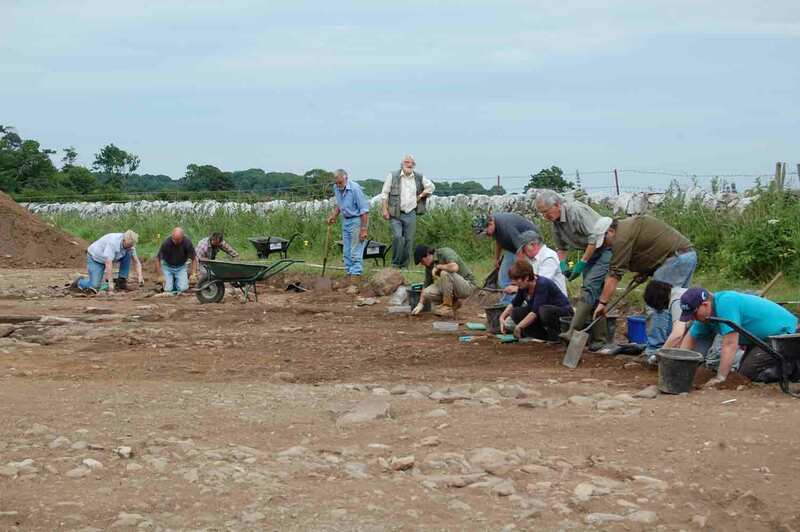 Plough soil now cleared off and George Smith and our merry group of volunteers have started excavating a gravel surface that looks like the Roman road. It looks like rain; for once a blessing! The ground is so dry that we can’t see colour changes in the soil and are struggling to work out what’s going on. More soil to be machined off tomorrow I think. Excellent!! It poured with rain all night; we now stand a chance of seeing what’s happening. 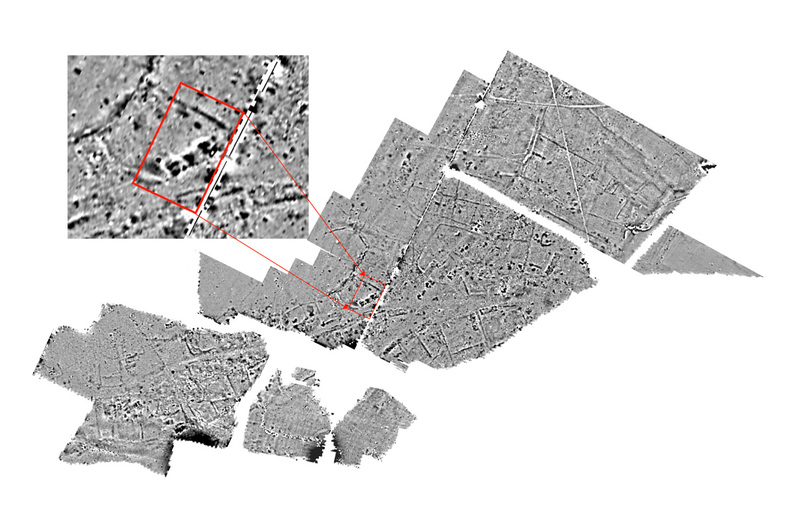 We can see the road and the outline of a big rectangular building that showed up on the geophys. A big ditch should also be visible so I reckon we need to clear a load of lower plough soil. More machine watching for me then. 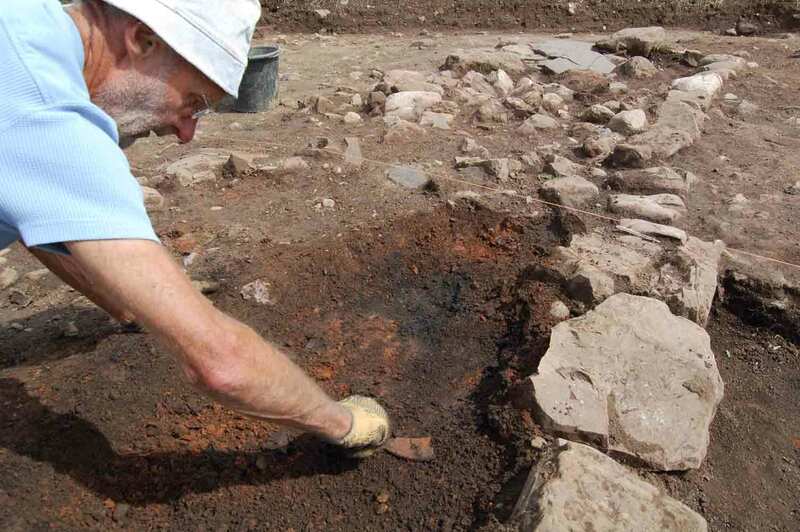 A TV crew making a documentary for S4C visited and recorded the beginning of the dig. One side of the building is now beginning to show, it looks as if it was destroyed by fire. Lots of pottery sherds turning up all over the site, and bizarrely what appears to be a lump of iron meteorite from the topsoil. Jack the landowner found a big one a few years ago. Finally finished machining off the topsoil, a great relief. A mistake with a big excavating bucket can remove a crucial bit of site conversely not enough soil taken off means days of shovelling and barrowing……. and we only have two weeks and three days left. A baking hot day today, with good progress. A few new volunteers turned up today so we have been able to clean back a fair bit of the site. The house wall is showing up in some places but not in others. Finds are coming thick and fast including a couple of coins, the remains of a fine bronze chain (unfortunately corroded almost to dust) and some large pottery sherds including imported samian ware, black burnished ware and amphora. Drizzle all day but could be worse! Not quite so many volunteers but progress none the less. 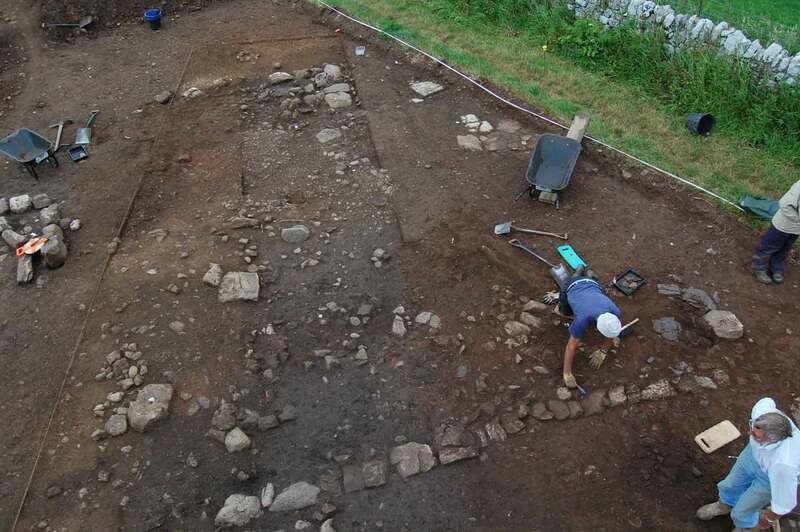 Most of the important elements of the site have had their first clean up; the building is fairly clear apart from the E end which needs a bit more soil removal. Still not quite ready for the first plan. I’m off to carry out a hi-res geophysical survey for the Royal Commission tomorrow. 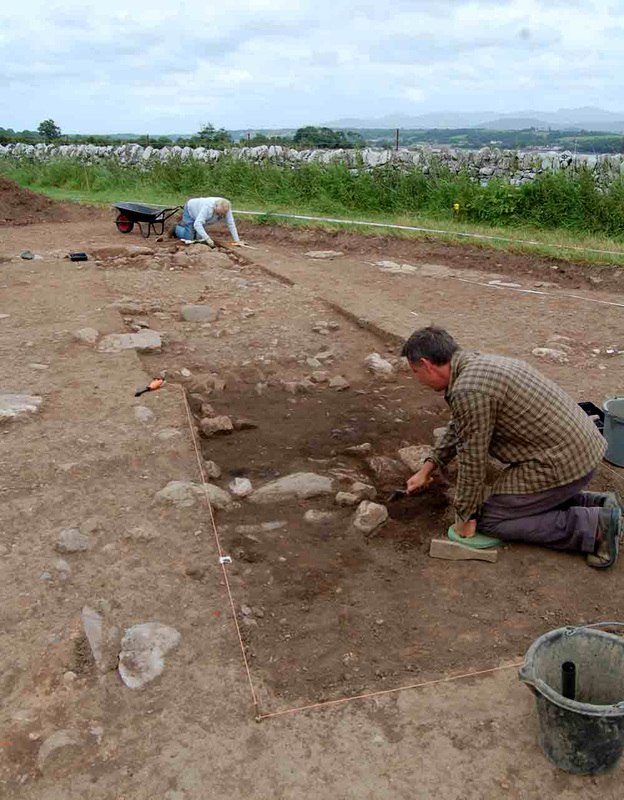 It’s at the possible Roman villa near Trawscoed fort that was shown on the Hidden Histories TV series. So will leave the site in the capable hands of George. Site still looking good despite the rain. One team is trying to establish the extent of the road. It keeps getting wider!! Gareth and I are trying to sort out a system for producing a detailed overhead matrix of photographs. A Heath Robinson contraption involving a 2m length of wood, a monopod, several cable ties and a remote control seems to work fairly well. George trying to find a way of planning what is a large and complex site without spending a week doing it. We have been examining a few outlying features. Two parallel rows of three postholes appear to be the supports for a granary. Elsewhere shallow rubbish pits seem to be fairly common. The boundaries to the plot containing the house are a shallow, distinctly non defensive, ditch and what appears to be a clay bank. A fair bit of catching up on recording and planning today. New areas opened up in the building. It seems to be filled with a fairly uniform burnt destruction layer but has not so far turned up many finds. Dominic, who has taken to archaeology like a fish to water, is sadly leaving us today because he has to start a new job. 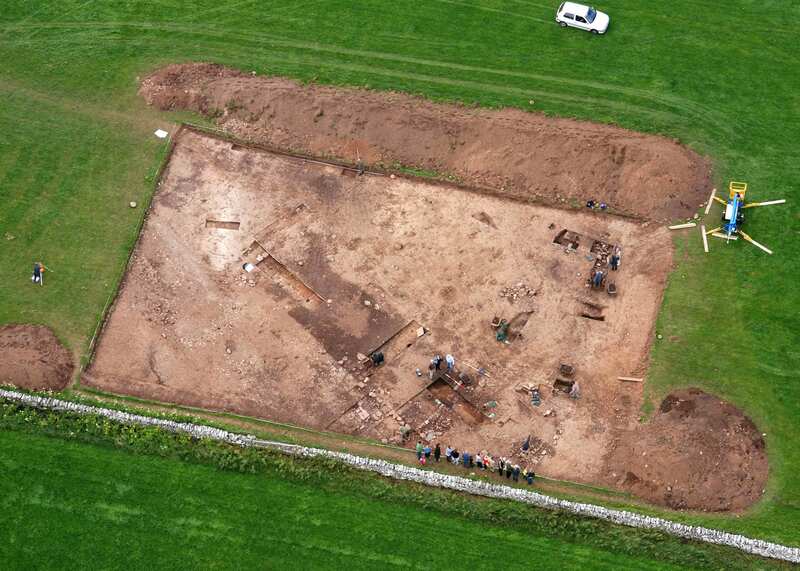 We are over half way through the dig now and have a fairly good overview of the site but now need to concentrate on more detailed examination of specific features, principally the building. A busy day, pouring with rain to start off with but it improved fairly quickly. We’ve had a camera crew making a documentary for S4C around for much of the day. They seem to be getting some good footage and haven’t got in the way too much. Lots of volunteers today including some new faces. We’ve nearly finished the second clean up of the N end of the building and have revealed a cobbly yard between the building and the road. We’ve fully excavated two sample trenches across the building but are still debating what conclusions we can draw from the evidence. Rained off in the afternoon. We were supposed to have a school visit from Ysgol Gynradd Brynsiencyn but unfortunately the monsoons have arrived early on Anglesey. So we went to them with a hurriedly put together PowerPoint presentation and finds collection etc. Hope to see a few pupils again on the open day on Saturday (10am to 4pm all welcome). A respite from the rain. The multiple phases at the end of the building are becoming a little more clear and lots of good datable pottery is coming out of this area. 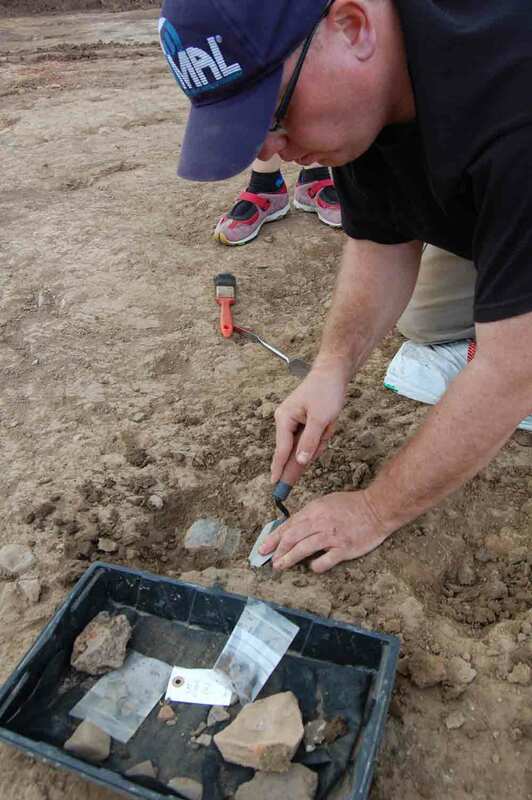 The main priority is to get everything recorded properly before the end of the dig. Arrived in the rain, site flooded yet again, trees down everywhere and a big boat washed up on the foreshore. Fortunately the weather improved so things moving on slowly. George has been working hard sorting out the site records but we won’t be finished today. Cake and wine from Bill!! Raining again, so off to B&Q to get a few sacks of bark chips to stop the entrance from turning into a quagmire. Fortunately the sun came out. 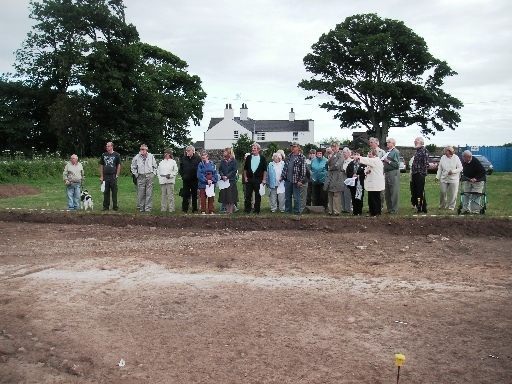 All in all it was a great success with around 200-250 people turning up (a lot of site tours!!). John Rowlands from Pixaerial got some great photos from a helicopter. Today was pretty much the end of the dig. Many thanks to all of the volunteers who turned up to help. Everybody has been really surprised at how much we managed to achieve in three weeks. 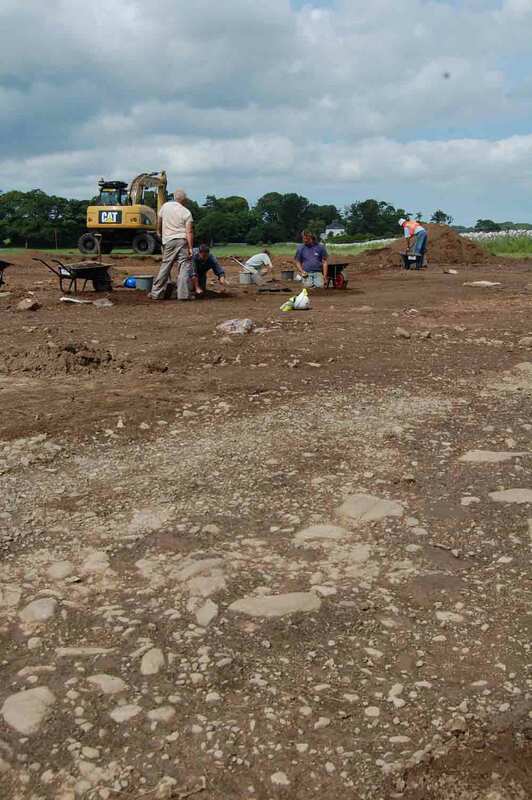 All in all it was a brilliant effort by everybody and we have finally managed to find some Roman remains on Anglesey!!! It was so busy on Saturday that we didn’t get everything recorded despite help from Jane Kenny. So George and I were back out again today. We managed to tie up most of the loose ends despite a quite remarkable amount of rain! Very interesting, please send me any updates! Fantastic experience working with the finds.will be there Friday pm. ‘stakehole’ feature could be a mole ‘home’ – breeding, feeding and winter refuge – good info on http://www.molecatchers.com. We both enjoyed the week, thanks and best wishes to you all for your patience and help with amateurs. Bob and Margaret. Please don’t leave us in suspense, let us know your findings? 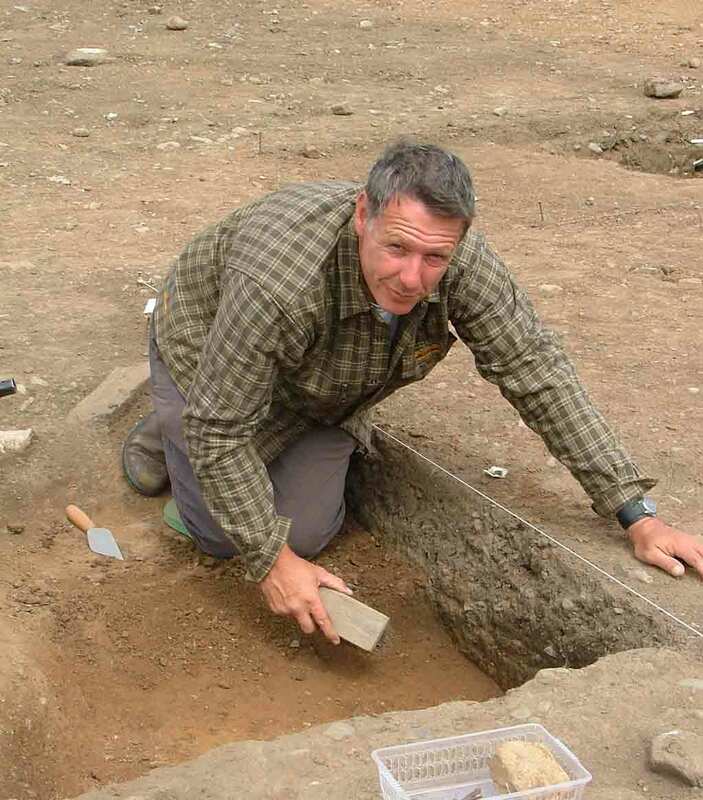 This has to be an important site for our understanding of Romano – Briton relationships. Great visit and everybody so helpful. Great blog. Am doing research in the North East Wales area, have found the info. most useful, particularly in identifying the overview of Roman activity and influence in North Wales. My only regret is that I missed the dig!! Best of luck in the future and better weather conditions!